Eileen often travelled to dog shows alone. She’d pack a bag and her thermos flask plus her dogs and set off across country where she would meet dog owning friends and have a great time. One weekend in December it was nearly her last trip. “I live in Kent and needed to travel up to Birmingham to the National Exhibition Centre. It was a straightforward journey, a few motorways, a stop to exercise the dogs half way and we were there in three hours traffic jams permitting. As we neared the southern part of Birmingham the skies grew a deep slate grey and I was glad to think we were close to our journey's end but then the snow started. Within minutes I couldn’t see even inches in front of the car. We crept along, surrounded by lorries. I did think that it was alright for them as their cabs were much warmer and snug than my own car, some even had beds and television sets. My two dogs, Jasper and Jet, Old English Sheepdogs slept soundly in the back of the car with not a care in the world. Then the traffic stopped dead. We didn’t move for about half hour. The radio news told of wide swept areas affected by the sudden change in the weather. Perhaps I was stuck for the night? I could not pick up a signal with my mobile phone but this was in the days before phone technology was at its best. I climbed out of the car and walked about for a bit on the deep snow. It was already impacted by the weight of the many vehicles that had ridden over it and slowly more snow fell. I spotted other dog owners in cars, there is quite a community amongst the dog show fraternity and we shared coffee and sandwiches and also loaned blanket to the few people that didn’t have enough in their cars for their dogs. The lorry drivers were marvellous and as night came and no sign of being towed off the motorway they turned on the beams from their vehicles and turned up their radios for us all to hear the news. The police climbed down the high banks of the motorway with drinks and those foil type blankets that sportsmen wear. It seemed that they could help some of us off the motorway but not our dogs as there was nowhere to take them overnight. Many of the dog owners decided to stay put and we shared cars and rugs to keep warm overnight. 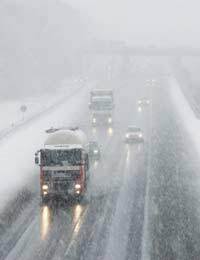 The snowstorm stopped overnight and by midday cars were being towed off the motorway and we were able to make our way home using roads that had been cleared. I was very relieved to see the end of my road appear.